At Great Deal Furniture, we want to help you create the perfect backyard environment to make your outdoor space a gathering place for family and friends. Our Gardena 7-Piece Outdoor Dining Set can comfortably seat up to six guests in any outdoor location. The rust-resis tant cast aluminum protects it from weather elements and makes this dining table a great pool-side seating and eating option. Its sturdy build, durable materials, and intricate design will offer years of sheer pleasure and make your outdoor space feel a little more like home. This furniture set comes with an elegant metal table and 6 comfortable and attractive metal chairs. The table is 59.20" L x 37.80" W x 28.50" H and each of the 6 chairs is 21.00" L x 22.75" W x 35.50" H. Some assembly required. 7-PIECE SET: Our dining set will meet all of your outdoor furniture needs. This high-class set includes 6 chairs and a table in a beautiful copper color, adding style to your space without sacrificing comfort. The chairs fit perfectly around the table for backyard family meals and picnics or lounging poolside with friends. RUST-RESISTANT METAL: At Great Deal Furniture, we bring you the best outdoor furniture available. 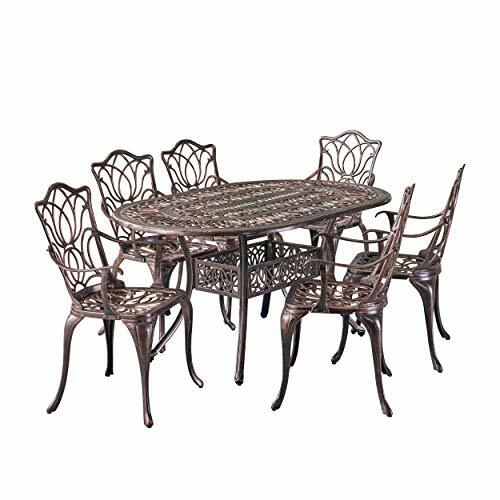 Our table and chairs are made of sturdy and durable cast aluminum that is rust-resistant, for years of outside use. If you use this set by the pool, it's all-weather quality helps prevent water damage caused by wet swimsuits and splashing. INTRICATE ANTIQUE DESIGN: We created our Gardena furniture set with cast aluminum and a rustic and aged copper look that stays in good condition, for years of entertaining. Our classic design looks great with other yard and patio decor. DECK, BALCONY & MORE: This dining set is the perfect addition to any space outside, like a backyard patio, outdoor deck, in a sunroom or garden, or near a pool, outdoor bar, grill, or BBQ pit. DIMENSIONS: Knowing the dimensions of new patio furniture is essential to ensure that you get a table and chair set that fits your needs and your space. Our cast aluminum table is 59.20" L x 37.80" W x 28.50" H and each of our 6 chairs is 21.00" L x 22.75" W x 35.50" H. You'll love how this rustic furniture set uniquely accents your space.